He had a pedigreed education and a corporate job overseas that he wanted to use for good. But while trudging in suit and tie through another 110-degree Delhi day, Franz Gastler had an epiphany that would end up lifting first his own life, then thousands more. It was dirt-caked soccer shoes that would lead him to his calling. He abandoned the office job and, in 2008, moved into a farmer’s mud hut in a rural swath of Jharkhand, India, where he taught English each morning to village girls. And then in the monsoon-drenched afternoons, he kicked around a soccer ball with his farmer host and some local friends. That one girl recruited 14 others, and they became a team that grew into a girls’ league, drawing hundreds more to practice daily atop flattened vegetable fields free of trees. As the girls’ confidence grew, Gastler realized he could help empower them through education to be changemakers in their society, and beyond. And his epiphany suddenly had a clear roadmap: linking sports with academics and technological training to crack the intractable hold of disadvantage and abuse. Girls in Jharkhand, India, face the danger of being trafficked and the pressure to drop out of school and get married. Franz Gastler’s Yuwa organization aims to help them recognize their worth and take control of their lives. To focus this mission, Gastler and three friends from high school founded a nonprofit and called it Yuwa, Hindi for “youth.” Using their own rented duplex house for classrooms, he and his now wife, Rose Thomson, opened the Yuwa school in 2015. First they taught the girls basic English, reading and writing; then they hired top instructors from some of the best universities in the U.S. and India to teach technology, math and science. 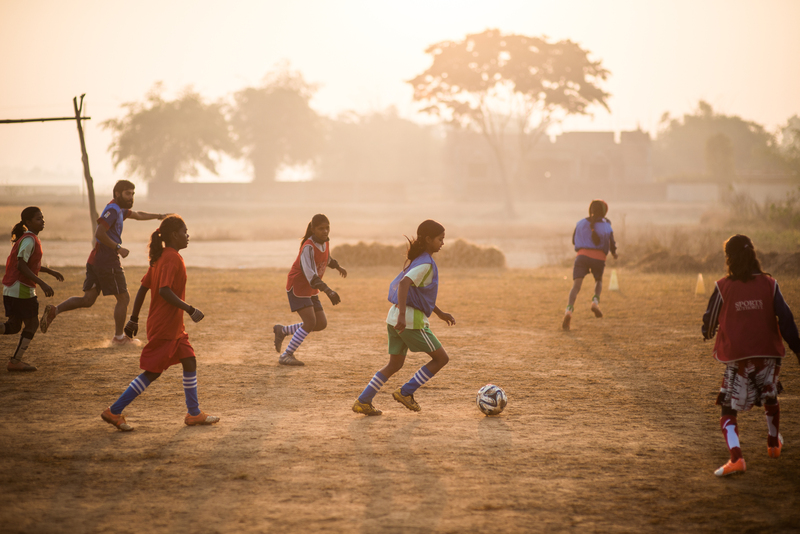 They made attending school at Yuwa or elsewhere – not a priority for girls in Jharkhand, where six in 10 drop out to become child brides – part of the soccer teams’ ethic. And with that focus, they began breaking a chronic cycle of damage and building a system to help young women recognize their worth and take control of their lives. In their home, the parlor triples as a coaches’ center and the school’s computer lab. Other areas, including the entryway and garage, serve as classrooms for math and science. With more girls clamoring to attend, the school spilled into a two-room, low-ceiling rental house nearby that floods during monsoons. Franz Gastler sees technology as a key to helping girls in Jharkhand, India, become international changemakers. As word of the program spread via media coverage of the Yuwa teams’ victories, both nationally and internationally, the student players flourished into youth icons. The program now includes more than 90 students, many under age 13, with about 300 soccer players who make up some 20 teams. Gastler is planning for 600 students and 2,000 soccer players. To accomplish those lofty goals, Gastler took part in the 2017 Microsoft Hackathon, emerging with an app he’d had in mind for four years, to replace a system of 25 spreadsheets and to help manage everything from attendance to library books to soccer jerseys. The app offers data insights to serve as an early warning system identifying if a girl may be in trouble. Separately, the Microsoft Edge team worked with Yuwa to provide an interactive website to help with fundraising efforts. It features videos and stories from the girls, a 360-degree view of key moments in the girls’ daily lives, including a soccer practice, and interactive infographics about Jharkhand and the challenges the students face along with the school’s effectiveness in changing their lives. Gastler hopes to raise $900,000 to fund the vision of a new school, including a tech lab outfitted with the latest equipment and software, sports facilities with dedicated soccer fields, and dormitories so the girls can study in safety. 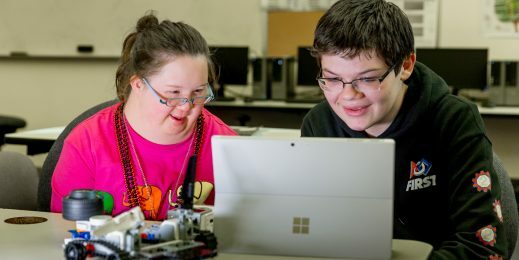 Microsoft recently added Yuwa to its internal Give program to help the group get started. The Yuwa girls’ makeshift soccer fields – nothing more than trampled vegetable fields – are a symbol of how girls are typically seen and treated in the region, even within their families. They’re often denied school and considered merely burdens to be used as menial laborers and married off as young as possible. Gastler tells of an image that’s been stuck in his mind for years exemplifying that treatment: He saw a 7-year-old girl carrying a bag of cement on her head while her 17-year-old brother walked behind her, composing a text message on his mobile phone. The schoolgirls have to be mindful of that culture when storing their soccer equipment. There’s not enough space to keep the balls and other gear in the duplex, so most of it goes home each night with selected players. It’s a matter of trust. Rose Thomson, who founded the Yuwa School with her husband, Franz Gastler, coaches girls on the group’s soccer teams in Jharkhand, India. In a recent essay, one Yuwa student, Asha, described her village elders this way: “They think girls should not play, wear shorts or climb trees. They think if they climb a tree, the tree will die. They think only boys can do everything; girls can’t do anything. But they think wrong.” With her Yuwa education, Asha said she plans to become a doctor. Through the gateway of soccer, Gastler’s team and the Yuwa girls are forging feminism, fighting for women’s rights by sticking with education – sometimes against their families’ wishes. It’s a commitment washed in exhaustion. Here’s a typical day for the girls: Wake at 4 a.m. and bring water from the well. Catch a bus to be at soccer practice by 5:30 a.m. Go back home to do housework and get ready for school. In class for six hours. Back home to do more housework and change for more soccer practice. Back home again to cook food for their families. Finally, study and sleep. Franz Gastler was a Minnesota hockey goalie and ski instructor before moving to India. At 36, Gastler has devoted the bulk of his life to sharing knowledge with kids. It started in his hometown of Edina, Minnesota, where he spent 12 winters working as a ski and snowboard instructor, schooling scores of children and teens on how to navigate steep drops and snowy tumbles. He later earned bachelor’s and master’s degrees in international political economy at Boston University as well as certificates in negotiation and mediation from Harvard Law School. In his 20s, seeking his place in the world, he traveled to India to work as a consultant at the Confederation of Indian Industry. He sees a natural harmony between grooming proper soccer skills and guiding students to use Office 365 to write their personal speeches for later delivery in English — and in big rooms, like TEDx talks. On the field and in the classroom, teamwork fuels deeper lessons never before absorbed by the girls of Jharkhand: self-confidence, self-reliance and self-worth. Gastler’s proudest moments, he said, come when he sees the girls tutor each other on everything from how to chip a pass to how to create and save a document. Franz Gastler and the Yuwa team aim to raise $900,000 to build a proper school in Jharkhand, India, with real soccer fields for the girls to practice on, a tech lab outfitted with the latest equipment and software, and dormitories for them to safely study in. One of his many rising stars is a 16-year-old girl named Radha. She coaches some of the Yuwa soccer teams before and after classes. She’s learning to craft speeches with Microsoft tools. And the technology is whispering to her about a once unimagined life. “She wants to be a mechanical engineer because people in Jharkhand think girls can’t do it, think the computers and technology are only for boys,” Gastler said. “She just likes to prove that she can do things as well as anybody else. She’s a go-getter. Learn more about Franz Gastler and the Yuwa team at http://microsoft.com/inculture/people-who-inspire/franz-gastler.